We recommend you service at an authorised MOTORCARE dealership – because all your car needs is the MOTORCARE Aftersales treatment. Our MOTORCARE technicians are highly trained specialists that know your vehicle better than anyone. Your new vehicle warranty is protected so long as you have your vehicle serviced at the recommended intervals as stated in your service schedule, and at your MOTORCARE Dealer. 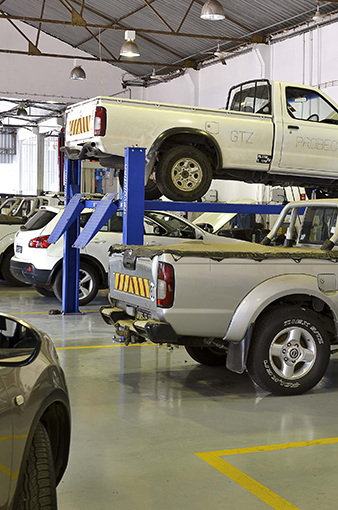 MOTORCARE Dealers will use Genuine Parts to ensure quality and reliability as they have access to diagnostic equipment, designed to keep your vehicle performing to optimum standards. All Genuine Parts have a 12-month manufacturer’s warranty. Our MOTORCARE workshops carry the international quality recognition status of fully integrated ISO certification ISO9001; ISO14001 and OHSAS 18001. This cements our competitive advantage and commitment to meet customers’ highest expectations of providing high standards of service, with consciousness of operational impact on the environment, and recognition for health and safety practices. Genuine Parts are specifically developed to keep your vehicle as good as new for longer. They are designed, tested and manufactured to the same exacting standards to fit perfectly for optimum performance, durability and safety. All Genuine Parts come standard with a 12 month warranty to ensure total piece of mind. Approved Body Repair Centres are the perfect answer to restoring your vehicle to its original standard. They use the same quality genuine parts and materials as those originally fitted to your vehicle. We promise you quality parts, quality repairs, and quality control with inspection to ensure that all work on your vehicle meets the precise standards required. We offer class-leading quality guaranteed repairs and replacement of windshields that are expertly fitted by our trained technicians to OEM specifications. Where possible, we’ll even conduct repairs while you wait getting you back on the road again fast. The car battery is an essential element required to start your vehicles engine. We supply quality assured batteries that will deliver high performance in even the most extreme conditions. When breakdowns stop your fleet from getting on with your daily business, it is our top priority to get you back on the road as soon as possible. Because we know “time is money”, through our Mobile Units we offer on -site maintenance and repairs, this increases “up-time” for the total fleet in operation and increases operational efficiency and return on your assets. Worn or damaged tyres are an accident waiting to happen. This can lead to a host of preventable operational headaches, unwanted legal litigation and even tragic loss of life. Why risk it? We ensure that all worn tyres in your fleet are replaced or changed out accordingly to seasonal conditions. Genuine Accessories are specifically designed and manufactured to give you excellent fit, reliability and performance without affecting your vehicles warranty. From protection or convenience, to personalisation, safety or technology – a wide range of accessories are available to customise your vehicle to suit your needs and fitted by our expert technicians to ensure safety standards are not compromised. Always insist on Genuine accessories.